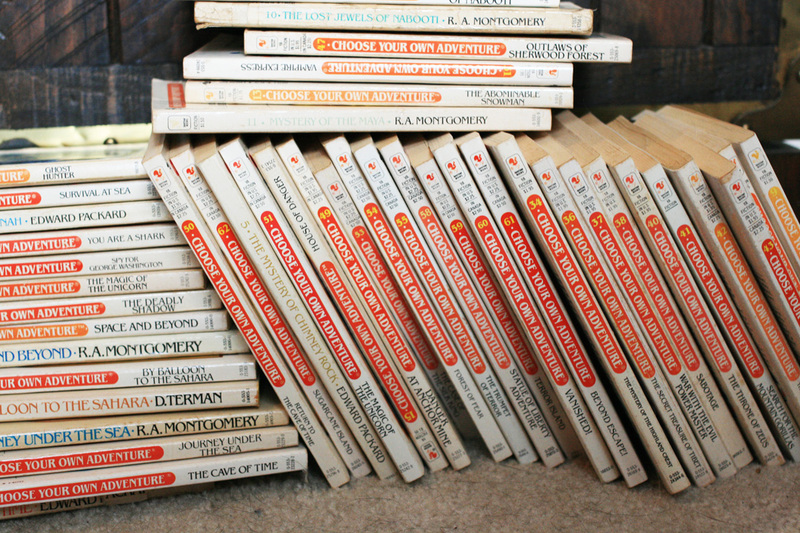 I used to love Choose Your Own Adventure books. They didn’t even have to be good; the concept alone drew my attention. As a reader, you were presented with options during the plot line. You made a decision, flipped to the appropriate page number, and the book played out the course of action… until the next conflict. The Adventure books are popular with kids because the reader has an impact on the outcome of the book— the story changes to suit interests and best judgments. There’s something underlying here: youngsters like making decisions in a Choose Your Own Adventure book because it allows them to do something “older” and adult-like. It lets them have a say in things. Maybe this is because adults are always making decisions for children— what to wear, what to eat, where to go… even what to think. Much of life is plotted out for young people. And mostly for good reason, if we consider the health and safety of our youth. Still, this gives some insight into why small decisions are important in child development. For me, I didn’t just make my chapter choices and move on. I would read every storyline. After choosing one direction of the story, I’d then go back and read through an alternative option— after that I would be compelled to go back again to make sure that I chose all directions from the first point before checking every option from the following point, etc., etc. I liked knowing all possible outcomes of the story. Choose Your Own Adventure books are aimed at young readers because, into our teen years, we realize that not knowing all potential outcomes can actually make a story more enjoyable. Not to mention the true plot of each Adventure book was only slightly adjusted by the perceived “choices” anyway. In other words, the novels, movies, and television series we enjoy are most exciting when they are thought-provoking— and maybe even plot twisting— but we don’t need to have direct input to be entertained. In fact, sometimes it’s the new ideas, offered by other points of view, that compel us to think and to feel beyond our mind’s own limitations. All of this considered, I still like complex plots. I still like multiple storylines. I still like parallel possibilities in movies and TV shows. Stories left up to interpretation can have me reeling and thinking for days. Often, what is interesting in a story isn’t just what happens from point A to point B, but also what might simultaneously happen from point A to point C, or point B to point D, or point E back to point A, or…. whatever. I’m confusing myself here, so I digress. To the point: Choose Your Own Adventure is a direct metaphor for real life. Reality is one big Adventure story. In any given instance, under any given circumstances, we wonder what might happen if we carry through with certain choices. What will happen if I act on this decision? What will happen to my future? How will people treat me? Will I be happy and successful? What if I made a career move? What if I pursued a different hobby? What if I relocated… tried a new language… took night classes… entered a relationship…? I get intrigued with the concept of time. (Funny, since I seem to be late everywhere I go.) Specifically, I am realizing more and more that the cliché is true: life is short. We are but a speck in the timeline of history. Smaller than that, if we look at the grandeur of the universe… or even multiple universes. We are no more than a comma on one page in a neverending novel. Actually, more like an infinite series of neverending novels. Let that comma analogy give you pause. Pun intended. When I get the rare chance to pause my own life— to just sit and think and reflect, I often find myself wondering what would happen if I could go back in time or if I could see the future. Would I still go through with my decisions, knowing the outcome? Would I take all that might transpire, each piece of information and conceivable occurrence, and compile it into my life story? Would that mean I try different approaches each year, each month, or each week? Would that completely alter this thing called consciousness? And is that even living? See, the options in life are almost endless as it is. Meaning is what we make of it. If we want a reason for living, we make it. This is a Choose Your Own Adventure to the Nth degree. The only issue is that we don’t get to see the storyline before it happens. Unlike the opening lines in the Adventure books, you can’t actually go back and make another choice, alter the path of your story, and change its result. But, instead, decisions occur daily to set forth the next chapter of our lives. And isn’t that enough? We may not be able to flip back a few pages and try a different decision or take a redo on a previous course of action, but we can always start now and make the best possible ending. Inside each of us is an adventure, and if we use what the children’s books call our “numerous talents” and “enormous intelligence,” it most certainly is an adventure worth living.